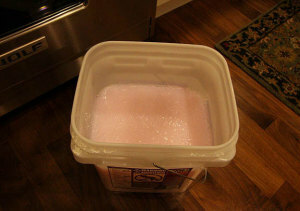 In the interest of spending less on something boring and consumable, I started making my own laundry detergent. 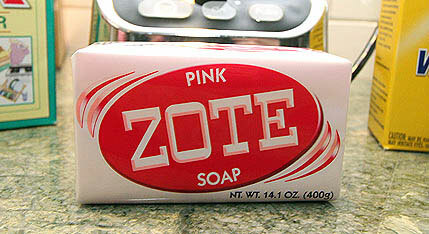 Pretty much any bar of soap will work; I use Ivory, Fels Naptha, or Zote. Fels Naptha and Zote are bar laundry soaps found in the laundry aisle. I prefer Zote because it’s pink and the bars are giant so I can make 2 batches! Grate the soap (I use my food processor). You’ll need a full bar for each batch (half a bar if you’re using Zote). While the soap is dissolving, measure 48 cups of hot water into the bucket (if you have a milk jug handy, that’s about 3 gallons). I marked the water level on the bucket with a Sharpie so I don’t have to measure anymore. Use 1/2 to 1 cup per load. This is a low sudsing soap and should be fine in HE machines. 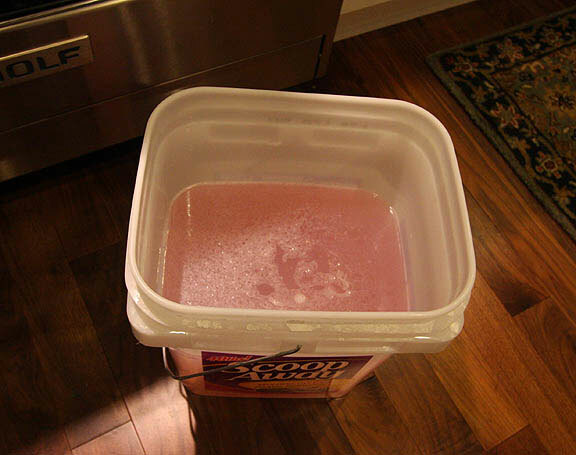 This is a great recipe…I use the grated up soap with the borax and arm & hammer dry, like a powdered detergent…..mostly cause I’m way too lazy to stir it all up and cook it on the stove!!! Either way, it works great!! Hi there! I definitely have to try this. It’s eco-friendly, right? Borax and washing soda are commonly used in environmentally friendly cleaning. Washing soda is made out of salt and limestone. Borax is a natural product that’s made out of sodium and boron. The only eco-impact variable is in which soap you use. I’ve seen Zote and Fels Naptha mentioned on several green living sites, which is why I use them. Castile soap might be even more eco-friendly. And Traci is right :) You can make a powdered version which is easier. I make both, but prefer the liquid because I find it lasts longer. Thank you so much for the recipe. I’m trying to convert to all green cleaning and personal products and being to make my own is even better. Any ideas for making softners and/or antistatic products? I love in the frozen north of the country and the static is so bad it’ll glue a small piece of furniture to your leg if you don’t use a softner. I do use those little drier balls to shorten dry time and hang things out when the weather allows. The only diy anti-static sprays that I’m aware of use commercial fabric softner (and sometimes ammonia), so they’re frugal, but not green. 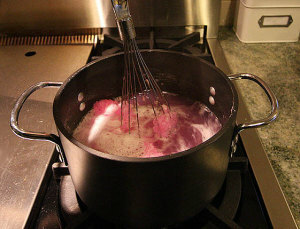 For fabric softener, I just add 1/4 – 1/2 cup of white vinegar to the final rinse. If you have a Downey ball, you can fill it with vinegar instead of Downey. This seems to help with static cling, too. 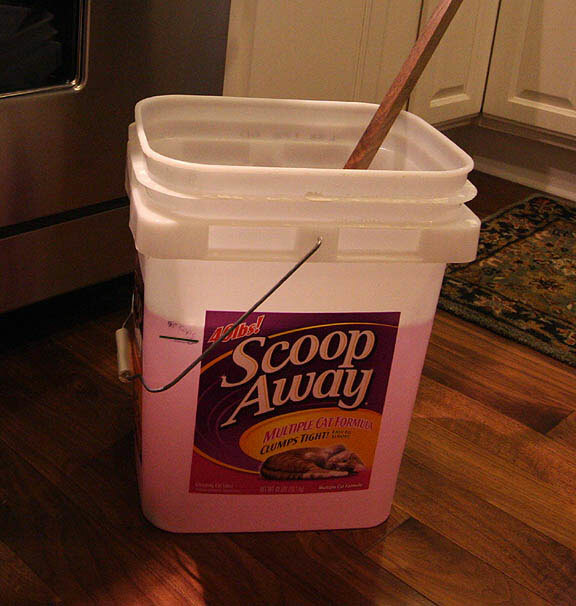 I have seen recipes for homemade fabric softener, but have not tried them because I’m happy with the vinegar. The smell dissipates when the clothes dry. I’ll try the vinegar. Our humidity here is so low that it will be a miracle if it keeps the static out but it’s worth a try. I love vinegar and use it for all kinds of cleaning tasks.